I just finished reading the book “Why Are All the Black Kids Sitting Together in the Cafeteria?” by Beverly Tatum, PH.D., and had to share it with you. In this book, Dr. Tatum explains racial identity development and unpacks how all people develop their racial identity in American society, especially in adolescence and in college. 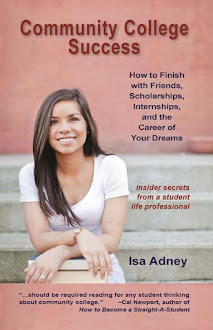 Reading her book reminded me of my own racial identity development, for which college was the catalyst. I am bi-racial: half White, half Puerto Rican. I like rice and beans and Taylor Swift. In high school, I never quite felt like I fully fit in with either racial group. When you’re half non-White, people usually consider you primarily the non-White race (in my case, Hispanic). But since I didn’t speak Spanish, I didn’t feel like I fully fit in (though of course that didn’t stop someone in the cafeteria once calling me a derogatory name for Hispanics). But when I got to community college, two classes completely changed my perspective: Latin American Humanities and an Honors Seminar on Identity. In Latin American Humanities, I was immersed in the art, culture, and history of my Latino roots, and I identified strongly. I don’t remember the artist’s name, but I’ll never forget the painting that depicted a Puerto Rican family celebration. I recognized the scene, I saw myself in it, and I identified. In the Honors Seminar on Identity, we were asked to get into identity groups and give two presentations: one on the stereotypes of our group, and the other on the barriers. It was a small class of only 12 people, but the groups started to form. The Black students made up a group, the LGBT students made up a group, the White students made up a group, the Hispanic students made up a group. I didn’t know where I belonged. And then, all of a sudden, there was another multiracial student in the class who spoke up. And we formed a group together, unpacking what it meant to be multiracial in a society that still, as much as we’d like to think it doesn’t, places a lot of emphasis on racial identity. And in the end, according to Dr. Tatum, we all need to unpack our own racial identity in a positive way. We need to discover it, own it, embrace it, and then move forward. Dr. Tatum really emphasizes the power of positive role models in this development process. Who are we seeing on TV that “looks like us”? What is the message being portrayed? How do our parents communicate our racial identity to us? Who are our role models who share a similar racial identity? I’ve also been reading a lot of books on the Millennial generation lately (people born 1982-2003), and generally speaking, we are a more accepting generation. We’ve grown up in a diverse world where Martin Luther King Jr. is an inspirational speech we watch in middle school and segregation is something we find shocking and - because of its horror – think happened much further in history than it actually did. We don’t place as much emphasis on race as previous generations. However, racial discrimination still very much exists. And our generation is perfectly positioned to do something about it. However, we cannot do anything until we understand our own identity, the identity development of others, and the realities of the discrimination that exists in the world we live in today. 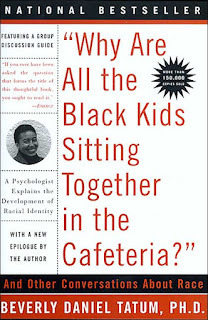 “Why Are All the Black Kids Sitting Together in the Cafeteria?” reminded me of my own constant identity development as a biracial woman, and, more importantly, helped me gain a deeper understanding of and a behind-the-scenes look into the identity development of other people. As a part of the millennial generation, we can fall into the trap of thinking racial discrimination doesn’t exist anymore, or that since we “don’t see color” we don’t need to think about it. But understanding who we are, where we come from, and what others experience is one of the best parts of college. It doesn’t happen automatically, though. We must seek those diversity experiences for ourselves. Dr. Tatum’s book is a great place to start.